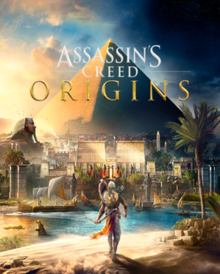 Origins received positive reviews from critics, who praised the story, characters, voice acting, reworked gameplay-systems, immersive world of Egypt, historical accuracy and the visuals, while criticizing some of the pacing and technical issues. The game was followed by Assassin's Creed Odyssey, which takes place in Classical Greece and was released on October 5, 2018. Players may travel around the game's open world of Egypt on horseback. Assassin's Creed Origins is an action-adventure stealth game played from a third-person perspective. Players complete quests—linear scenarios with set objectives—to progress through the story, earn experience points, and acquire new skills. Outside of quests, the player can freely roam the open world environment on foot, horseback, camel-back, horse-drawn vehicles or boat to explore locations, complete optional side-quests and unlock weapons and equipment. The "eagle vision" mode, which was used by the franchise to give the player the ability to scout an area by highlighting enemies and objects, has been replaced by a Bonelli's eagle named Senu as a companion. The player is able to take control of Senu and scout an area in advance, highlighting enemies which will then be visible when they return to controlling Bayek, the game's main character. The player can also tame various predators which will serve as a companion for the player and assist them against enemies. Naval combat, underwater exploration and tomb raiding return to the series. The game also features revised combat mechanics. Previous titles in the Assassin's Creed series used a "paired animation system" whereby the player character would engage with an enemy and combat would be dictated by a series of predetermined animations based on player inputs and scripted AI movements. Origins moves to a "hit-box system". When the player wields a weapon, they will strike at whatever is in range, allowing them to hit enemies directly, injure individual body parts, and creating the possibility of missing an enemy entirely. Complementing this is the way weapons fall into different categories and are rated on their damage dealt, speed and range. Enemies will be drawn from several basic archetypes that use a variety of tactics in combat which, combined with the hit-box system, will require the player to learn the attributes of individual weapons and tailor their playing style to succeed in combat. As enemy combat is also dictated by the hit-box system, the player has been equipped with a shield and needs to balance their offensive and defensive capabilities. Locations within the game world are designed to enable the player to choose their playing style by offering stealth and open combat as equally-viable choices for completing objectives. Origins introduces an arena-based combat system where the player fights waves of increasingly difficult combinations of enemies culminating in a boss fight. While the introduction to the arena is incorporated into the main story, the arena mode stands alone from the wider narrative. The game world features several arenas, with a variety of enemy combinations and unique bosses not found in the game world. The player is able to unlock additional weapons and equipment by completing arena fights. The player takes on the role of a Medjay named Bayek and his wife Aya, as they work to protect the people of the Ptolemaic Kingdom during a time of widespread upheaval: the Pharaoh, Ptolemy XIII, struggles to maintain his rule while harbouring ambitions of expanding his kingdom; his sister, the recently deposed Cleopatra, begins marshalling loyalist forces to launch a counter-coup against Ptolemy; and frequent incursions into the Kingdom by the Roman Republic under the command of Julius Caesar lead to fears of an imminent invasion. Bayek's role as a Medjay brings him and Aya into contact with the secretive forces manipulating these events and into becoming the first Assassins. In 49 BCE, Bayek, a Medjay charged with protecting the Siwa Oasis, is abducted along with his son Khemu by a group of masked men and taken to an underground vault in the Temple of Amun. The masked men give Bayek a dormant Apple of Eden and demand that he use it to open a secret Vault. Khemu helps Bayek escape, but while struggling with one of the masked men, Bayek inadvertently kills Khemu. One year later in 48 BCE, Bayek has exiled himself to track down the five masked men to take his revenge. He finds the first one, Rudjek "The Heron", and kills him. Bayek then returns to Siwa to kill the local priest Medunamun, "The Ibis", who has been torturing Siwans for information to open the same vault. Bayek then heads for Alexandria, where Aya has been tracking another of the masked men. Aya reveals that she has already killed Actaeon "The Vulture" and Ktesos "The Ram", leaving only one target left, "The Snake". Bayek identifies the Royal Scribe Eudoros as The Snake, but Bayek is disturbed by Eudoros' last words, which imply there are more masked men. Aya directs Bayek to her friend Apollodorus the Sicilian for more information. Apollodorus introduces him to Cleopatra, who confirms that the masked men form the Order of Ancients. The Order ousted her from the throne and seek to control all of Egypt by using Ptolemy as their puppet. Cleopatra gives Bayek four new targets: "The Scarab", "The Hyena", "The Lizard" and "The Crocodile". He tracks them down and kills them while Aya convinces Pompey the Great to ally with Cleopatra. Bayek receives a letter from Aya explaining that there are more members of the Order at large, including members of Ptolemy's royal guard who are the likely culprits responsible for Khemu's death. Bayek begins to question his mission, believing Cleopatra is using him to kill her rivals. Pompey is killed by Lucius Septimius, "The Jackal", forcing Bayek and Aya to sneak Cleopatra into the palace to meet Julius Caesar. Cleopatra impresses Caesar and secures his support. Bayek kills Pothinus, "The Scorpion", but is stopped from killing Septimius by Caesar. Aya watches Ptolemy get eaten by crocodiles when he tries to flee across the Nile. Cleopatra takes the throne as Pharaoh. Septimius becomes an advisor for Caesar and Cleopatra cuts ties with Bayek and Aya. This causes Bayek and his supporters to realize that Cleopatra and Caesar have now allied themselves with the Order. Bayek gathers his allies to form a brotherhood to counter the Order and defend the free will of the people. Bayek and Aya realize the Order showed interest in the tomb of Alexander the Great, where they find a mortally wounded Apollodorus. Apollodorus warns them that Caesar's lieutenant Flavius is "The Lion" and the true leader of the Order. He and Septimius had taken the Orb and a Staff from the tomb and are going to Siwa to open the Vault. Bayek tracks Flavius to Cyrene, where he has used the activated Apple of Eden to hold the population in thrall. He kills Flavius, avenging Khemu's death and returns to Aya. Aya recruits Marcus Junius Brutus the Younger and Gaius Cassius Longinus to their cause. She heads to Rome with Brutus and Cassius to assassinate Caesar and Septimius. Bayek and Aya part ways but form the foundation of the Assassin Brotherhood when they both swear to protect the world from the shadows. In Rome, Aya confronts Septimius, who wields the Staff of Eden and she kills him. She then infiltrates the Roman Senate and assassinates Caesar. Later, she meets with Cleopatra and warns her to be a fair ruler or she will return to assassinate her. Afterward, Bayek and Aya (now calling herself Amunet)[b] begin recruiting and training other Assassins as they build the Assassin Brotherhood in Egypt and Rome respectively. In the present day, Layla Hassan, a researcher for Abstergo Industries, is tasked with finding and retrieving an artifact in Egypt. However, she instead finds a tomb containing the mummies of Bayek and Aya. Hoping to find any relevant information that would secure her a position in the company's Animus Project, Layla decides to relive both Bayek and Aya's memories using a modified Animus without telling her superiors. When Layla fails to report in, Abstergo send a team to kill her. Layla thwarts the attempt on her life, but her friend and support officer Deanna is killed. Layla returns to the Animus, but is later woken by William Miles, the Assassin Mentor. She accepts William's offer to work with the Assassins, but stops short of actually joining them. The two depart for modern-day Alexandria. In experiencing Bayek's memories, Layla may encounter a series of ancient structures built by the First Civilisation. Each contains a message that alludes to Layla playing a pivotal role in an upcoming apocalyptic event. Ubisoft released two chapters of story-based downloadable content that continue the narrative of the main game. In the first chapter, The Hidden Ones, Bayek is called to the Sinai Peninsula by Tahira who oversees the local Assassin bureau. Sinai is under occupation by the Roman Empire, who are forcing the local population to mine turquoise. Tahira is concerned that the Assassins' support for a rebel faction has led to their exposure and requests Bayek's aid. Bayek agrees that the Assassins are vulnerable and decides to kill the three lieutenants of General Rufio, the consul of Sinai, in the hopes of drawing him out. Although successful, the lieutenants taunt Bayek with the claim that the Order of Ancients still exists. The Assassin bureau is fire-bombed and Tahira is killed. Bayek is captured and crucified, only to be saved by the arrival of Amunet, who warns him that his actions in Sinai risk exposing the entire Assassin Brotherhood. Rufio arrives and begins slaughtering the villagers as a means of subjugating the population. Bayek and Amunet stop the massacre and Bayek kills Rufio, who reveals that Caesar rebuilt the Order of Ancients and that their influence extends the breadth of the Empire. Amunet asks Bayek to look into Gamilat, the rebel leader, who has provoked fights with the Romans then hidden his men among civilians, knowing that the Romans will kill indiscriminately; he then uses this to recruit new soldiers. Bayek confronts Gamilat and kills him when he defends his actions as a necessary evil. With the people believing the Assassins destroyed, Bayek decides to discreetly rebuild the Brotherhood and expand to Judea, the Levant and beyond. In the second chapter, The Curse of the Pharaohs, Amunet asks Bayek to investigate a disturbance in Thebes which she believes is a sign of another Piece of Eden. Bayek arrives to find the city in the grip of fear as apparitions of the undead plague the region. He learns that two relics have been stolen from nearby tombs: the first belonging to Nefertiti has been taken by black market antiquities dealers who intend to sell it; the other belonging to Akhenaten was stolen in retaliation for a cult worshipping him being established in Thebes as veneration of Akhenaten is considered heresy. Believing the relics will offer the user the same power that Flavius used to subjugate Cyrene, Bayek resolves to return the relics to their proper places. He tracks both relics to a Greek official named Tychon who is based in the Temple of Hatshepsut. After recovering the relics, he visits the tombs of Nefertiti and Akhenaten in the Valley of the Kings and finds them desecrated. The only way to restore balance is to cross over into the afterlife. Bayek discovers that these are reflections of the mortal world and that the corruption that has taken hold in Thebes has spread to the afterlife. He realises that Aten, the god worshipped by the monotheistic Akhenaten, is actually the Piece of Eden he is looking for and that Akhenaten was not buried with it; instead, it was passed on to his descendants and is held by the cult of Amun. The curse plaguing Thebes was unleashed by Isidora, a priestess of Amun as revenge for the death of her mother. Bayek follows her to the tomb of Tutankhamun where she tries to justify her actions. When she refuses to stand down, Bayek kills her and takes possession of the Aten. He entrusts it to Sutekh, a thief who aided his quest, with burying it in a place where it will never be found. The Hidden Ones is a story-driven expansion that sheds more light on the rise of the Assassin Brotherhood. It is set four years after the events of the main game and takes the player to the Sinai Peninsula region, where they will have to investigate a clash between a rebel faction and occupying Roman forces. In addition to the new story chapter, The Hidden Ones introduces a variety of new items for the player to acquire, including an outfit, two Legendary weapon sets, a pair of mounts, and other weapons. The expansion raises the game's level cap to 45. The new educational mode lets the player choose between free roaming the world of Ancient Egypt to learn more about its history and daily life, or embarking on guided tours curated by historians and Egyptologists. This disables the storyline, side-quests, conflicts with enemies, time limits, and gameplay constraints. Discovery Tour was released on February 20, 2018. A standalone expansion with only the Discovery Tour included was also released for Windows specifically for the educational market. Discovery Tour is based on reliable research results from universities and institutions like the British Museum. The second expansion is a new quest, set in Thebes, about an ancient curse that is plaguing the land due to grave robbers angering the gods. The Curse of the Pharaohs focuses on Egyptian mythology, pitting players against famous pharaohs and Egyptian beasts, as they uncover the cause of the curse that has brought certain dead rulers back to life. The Hidden Ones raises the level cap to 45 while The Curse of the Pharaohs increases it to 55. Like The Hidden Ones, the expansion adds new outfits, gear and weapons, these themed around ancient Egyptian mythology. The Curse of the Pharaohs was released on March 13, 2018. Information on Origins, then titled Assassin's Creed Empire, first leaked in January 2017, showing several screenshots of a character on a boat and in front of a cave. The game was officially revealed on June 11, 2017. It was developed using the latest iteration of the AnvilNext engine. During production of Assassin's Creed III in November 2011 Ubisoft conducted a fan survey exploring potential settings for future titles. Ancient Egypt was one of the most popular choices, but Alex Hutchinson, the creative director of Assassin's Creed III, dismissed the results as he considered Ancient Egypt—as with the other two chosen settings, feudal Japan and World War II—as being "the worst choices" for a setting. The development team hired Egyptologists to assist in making the open world more accurate to the time period. In August 2017, Square Enix announced a promotional crossover between the Assassin's Creed franchise and Final Fantasy XV. Taking the form of an in-game event, it introduced Assassin's Creed-themed content to the game. Assassin's Creed-themed content was also made available in other Ubisoft games such as Tom Clancy's Ghost Recon Wildlands and South Park: The Fractured but Whole. Assassin's Creed Origins received "generally favorable" reviews from critics, according to review aggregator Metacritic. Louise Blain from GamesRadar+ gave the game a score of 5 out of 5 stars and called it the best of the franchise, saying that "As beautiful as it is deadly, Origins' Egyptian playground is finally everything you wanted the Creed to be." Ray Carsillo's score of 9/10 on EGMNow said that "Assassin's Creed Origins delivers a robust experience that mixes up the traditional Assassin's Creed formula in a way that's fresh and fun to play—but which also harkens back to the series' roots in some welcome ways, too. It marks an evolution fans might not have even known they were waiting for, delivering one of the best overall experiences we've seen yet from the series." Alanah Pearce's 9/10 review on IGN stated that "Assassin's Creed Origins is a deep-dive into a truly stunning realization of ancient Egypt, with a rich series of cultures, genuine characters, and more mission variety than any other game in the series. The combat is challenging and thoughtful, and while the loot system doesn't match up to games like Destiny 2, there are enough different weapon types and enough enemy variety to keep you swapping between weapons, catered to the situation. The RPG elements encourage challenges of their own, and even despite a handful of bugs, I desperately wanted to keep playing." Colin Campbell of Polygon gave the game a score of 8.5/10, writing, "In essence, Assassin's Creed Origins is much the same game as the original Assassin's Creed, which came out a decade ago. It's a formula that people like to play, and it's certainly been honed and improved over the years. Origins is, then, undoubtedly the best iteration of this formula yet. But I yearn for a fresh approach and new ideas, something that astounds the senses as much as the wondrous world this game inhabits." The game's historical accuracy and use of historians and Egyptologists was praised by Windows Central and Forbes, which referred to it as "perhaps the most realistic recreation of classical Egypt ever made." Vice spoke about this to Harvard Egyptologist Peter Der Manuelian, who highlighted many of the game's efforts. GameSpot gave the game a 7/10, saying: "While Assassin's Creed Origins reaches great heights in this new setting, it routinely runs into issues that bog down the overall experience. Technical issues make for an inconsistent experience and its new gameplay pillars wobble under the weight of its systems. But despite this, the world of Origins remains fresh and exciting to explore, which is a testament to the remarkable setting and compelling story." Eurogamer ranked the game 23rd on their list of the "Top 50 Games of 2017", GamesRadar+ ranked it third on their list of the 25 Best Games of 2017, and EGMNow ranked it sixth on their list of the 25 Best Games of 2017, while Polygon ranked it 15th on their list of the 50 best games of 2017. The game won the award for "Best Open World Game" in PC Gamer's 2017 Game of the Year Awards, whereas its other nominations were for "Best Setting" and "Game of the Year". It was also nominated for "Best Xbox One Game" in both Destructoid's Game of the Year Awards 2017 and IGN's Best of 2017 Awards, the latter of which also nominated it for "Best Action-Adventure Game" and "Best Graphics". In Giant Bomb's 2017 Game of the Year Awards, the game won the award for "Best New Character" (Bayek), and was a runner-up for "Best World". It also won the award for "Best Setting" in Game Informer's 2017 Action Game of the Year Awards. Kotaku's Jason Schreier discovered that many of the game's user reviews on review aggregator Metacritic were artificially improved through the use of an online bot. In an article on history-themed video games, the Damals magazine wrote that the Discovery Tour mode presented a transformation from an entertainment product to an interactive learning aid. In its 2018 exhibition on the "Queens of Egypt", the Pointe-à-Callière Museum of Montreal, Canada, incorporated images and video sequences from Discovery Tour. In November 2017, Ubisoft announced sales of Assassin's Creed Origins during its first 10 days were double that of Assassin's Creed Syndicate, while player engagement also saw an increase. 35% of the sales were digital download, compared to just 12% for Syndicate. ^ Additional work by Ubisoft Singapore, Ubisoft Sofia, Ubisoft Bucharest, Ubisoft Chengdu, Ubisoft Kiev, Ubisoft Montpellier, Ubisoft Quebec, Ubisoft Philippines and Ubisoft Shanghai. ^ In Assassin's Creed II, Amunet is described as having assassinated Cleopatra in 30 BC. ^ a b Blain, Louise; Roberts, David (June 12, 2017). "Assassin's Creed Origins to get "tons" of challenging boss fights". GamesRadar+. Future plc. ^ Plagge, Kallie (June 11, 2017). "E3 2017: Assassin's Creed Origins Is A True Open-World RPG". GameSpot. CBS Interactive. ^ Wallace, Kimberley (June 11, 2017). "Five Things You Need To Know About Assassin's Creed Origins". Game Informer. GameStop. ^ Minotti, Mike (June 11, 2017). "Why Assassin's Creed: Origins is going to Egypt and revamping the series". GamesBeat. ^ a b Gurwin, Gabe (June 11, 2017). "Everything we know about Assassin's Creed Origins". Digital Trends. ^ a b Blain, Louise (June 11, 2017). "I've played Assassin's Creed Origins and OMG EVERYTHING has changed. Here are 8 reasons you'll be going to Ancient Egypt". GamesRadar+. Future plc. Retrieved September 1, 2017. ^ Morris, Tatiana (August 18, 2017). "[Watch] Assassin's Creed Origins dev details weapon types, combat changes, and more". GameZone. Retrieved September 1, 2017. ^ Martin, Matt (June 28, 2017). "Gladiator Arenas in Assassin's Creed Origins are bloody fun, but I'm worried about the stupid enemies". VG 247. Retrieved September 1, 2017. ^ de Rochefort, Simone (October 25, 2017). "Assassin's Creed 2 may have given us a hint about Origins". Polygon. Retrieved January 19, 2018. ^ a b Knezevic, Kevin (January 23, 2018). "DLC The Hidden Ones is out". Gamespot. Retrieved January 23, 2018. ^ Orland, Kyle (September 27, 2017). "Combat-free mode makes Assassin's Creed: Origins incredibly easy to explore". Ars Technica. Retrieved September 27, 2017. ^ "Assassin's Creed Origins is getting an educational mode early next year". The Verge. September 27, 2017. Retrieved September 27, 2017. ^ a b Madan, Asher (January 17, 2018). "Ubisoft reveals release dates for future Assassin's Creed Origins story expansions". Windows Central. Retrieved January 17, 2018. ^ "Right on target: using video games to enhance learning". UdeMNouvelles. Retrieved June 8, 2018. ^ a b Schwarz, Angela (2018). "Bin dann mal Geschichte machen". Damals (in German). Vol. 50 no. 9. pp. 58–63. ^ Gach, Ethan (June 11, 2017). "Assassin's Creed Origins finally announced for real, set in Egypt". Kotaku. Gawker Media. ^ "A message from the Assassin's Creed team". Ubisoft. February 11, 2016. Retrieved August 13, 2017. ^ Macy, Seth G. (February 11, 2016). "Ubisoft confirms no Assassin's Creed this year". IGN. Retrieved August 13, 2017. ^ "Assassin's Creed Origins PC release date and hardware". Gamespot. Retrieved October 22, 2017. ^ Robinson, Andy (November 29, 2011). "AC:3 Possible Locations Named In Survey". Computer and Video Games. Future plc. Archived from the original on December 1, 2011. Retrieved January 28, 2018. ^ Dutton, Fred (April 4, 2012). "Ubisoft: WW2, Japan and Egypt would make dismal Assassin's Creed locations". Eurogamer. Retrieved October 2, 2017. ^ Hester, Blake (August 22, 2017). "Assassin's Creed Origins will have the series' largest map". Rolling Stone. Jann Wenner. Retrieved October 21, 2017. ^ McMillan, Emily. "First glimpse of Sarah Schachner's Assassin's Creed Origins on Billboard". Video Game Music Online. Retrieved October 20, 2017. ^ "Final Fantasy 15 is getting free Assassin's Creed crossover DLC". Eurogamer. August 24, 2017. Retrieved September 3, 2017. ^ Square Enix (August 31, 2017). Final Fantasy XV. PlayStation 4, Xbox One. Square Enix. Level/area: Lestallum Assassin's Festival. Ignis: Ah, the Leap of Faith ... one of the Assassins' finest acrobatic feats. ^ "Pre-Orders and Limited Editions". IGN. Retrieved August 21, 2017. ^ a b "Assassin's Creed Origins for PC Reviews". Metacritic. Retrieved October 26, 2017. ^ a b "Assassin's Creed Origins for PlayStation 4 Reviews". Metacritic. Retrieved October 30, 2017. ^ a b "Assassin's Creed Origins for Xbox One Reviews". Metacritic. Retrieved October 26, 2017. ^ Carter, Chris (October 27, 2017). "Review: Assassin's Creed Origins". Destructoid. Retrieved October 28, 2017. ^ "Assassin's Creed Origins". Edge. No. 313. Future. November 9, 2017. pp. 100–102. ISSN 1350-1593. ^ a b Carsillo, Ray (October 26, 2017). "Assassin's Creed Origins review". EGMNow. Retrieved October 26, 2017. ^ Vazquez, Suriel (October 26, 2017). "Keeping The Faith By Questioning It – Assassin's Creed Origins – Xbox One". Game Informer. Retrieved October 26, 2017. ^ Leri, Michael (October 26, 2017). "Assassin's Creed Origins Review – Egyptian Addiction". Game Revolution. Retrieved October 26, 2017. ^ a b Fillari, Alessandro (October 26, 2017). "Assassin's Creed Origins Review". GameSpot. Retrieved October 26, 2017. ^ a b Blain, Louise (October 26, 2017). "Assassin's Creed Origins review". GamesRadar+. Future plc. Retrieved October 26, 2017. ^ a b Pearce, Alanah (October 26, 2017). "Assassin's Creed Origins Review". IGN. Retrieved October 26, 2017. ^ Livingston, Christopher (November 1, 2017). "Assassin's Creed Origins review". PC Gamer. Retrieved November 1, 2017. ^ a b Campbell, Colin (October 26, 2017). "Assassin's Creed Origins review". Polygon. Retrieved October 26, 2017. ^ Bell, Alice (November 1, 2017). "Assassin's Creed Origins review". VideoGamer.com. Retrieved November 1, 2017. ^ GamesRadar staff (December 22, 2017). "The best games of 2017: Page 3". GamesRadar+. Future plc. Retrieved January 2, 2018. ^ PC Gamer staff (December 26, 2017). "Best Open World Game 2017: Assassin's Creed Origins". PC Gamer. Retrieved January 1, 2018. ^ PC Gamer staff (December 8, 2017). "Games of the Year 2017: The nominees". PC Gamer. Retrieved January 1, 2018. ^ Makedonski, Brett (December 11, 2017). "Nominees for Destructoid's Best Xbox One Game of 2017". Destructoid. Retrieved January 3, 2018. ^ "Best of 2017 Awards: Best Xbox One Game". IGN. December 20, 2017. Retrieved December 29, 2017. ^ "Best of 2017 Awards: Best Action-Adventure Game". IGN. December 20, 2017. Retrieved December 29, 2017. ^ "Best of 2017 Awards: Best Graphics". IGN. December 20, 2017. Retrieved December 29, 2017. ^ Miller, Matt (January 5, 2018). "2017 Action Game Of The Year Awards". Game Informer. GameStop. Retrieved January 8, 2018. ^ Crescente, Brian (November 7, 2017). "Assassin's Creed Origins Sells Twice as Fast as Previous Game". Rolling Stone. Jann Wenner. Retrieved November 7, 2017. ^ Sarkar, Samit (June 26, 2017). "Mario + Rabbids, Wolfenstein 2, Shadow of War lead E3 critics' nominations". Polygon. Retrieved August 13, 2017. ^ "Awards - The Game Awards". The Game Awards. Retrieved December 8, 2017. ^ "Steam Awards 2017 nominees announced". IGN. December 21, 2017. Retrieved November 7, 2018. ^ Pedersen, Erik; Haithman, Diane (February 13, 2018). "VES Awards Live Blog & Winners List". Deadline Hollywood. Retrieved February 14, 2018. Wikimedia Commons has media related to Assassin's Creed Origins. Wikivoyage has a travel guide for Assassin's Creed: Origins.